Pancakes require only a few ingredients, are easy to make and are enjoyed by people around the world. The most difficult aspect of making pancakes is knowing when they are ready to be served. Pancakes can burn easily or appear done when they are not. With a little practice, you can make a perfect pancake. 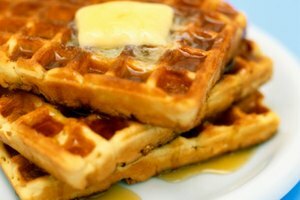 Follow a recipe or the instructions off a pancake batter mix to create pancake batter. Pour your pancake batter onto a preheated, oiled skillet or grill. 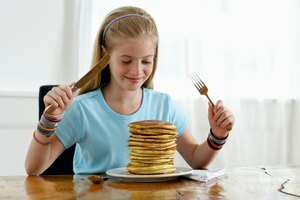 Keep in mind that thick batter will make thick pancakes, which will not cook as evenly as thin pancakes; larger pancakes will be more difficult to flip than smaller pancakes. 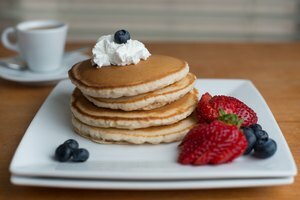 For best results, pancakes batter should be slightly runny, similar to the consistency of white craft glue, and when poured, pancakes should be no more than 6 inches in diameter. Allow your pancake to cook on medium heat for two to five minutes. Do not leave them unattended. When the uncooked batter on the top of the pancake begins to form bubbles, the pancake is ready to be flipped. Test the pancake by sliding a spatula under the edge of the pancake. If the pancake separates from the pan easily and is a golden-brown color, slide the spatula underneath the center of the pancake, lift, and then rotate the spatula so that the uncooked side of the pancake lands on the skillet. Allow your pancake to cook for an additional two to five minutes. 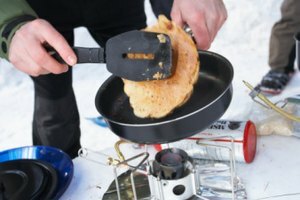 Test your pancake after two minutes on the second side, and every 30 seconds afterwards, by slipping the spatula under the rim of the pancake and lifting it slightly. If the bottom of the pancake is golden-brown, the pancake is probably done. Insert a toothpick into the center, or thickest part, of your pancake. Remove the toothpick after about two to three seconds. 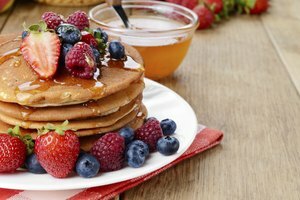 If there is batter clinging to your toothpick, your pancake needs to cook for another minute or two; if the toothpick is clean, your pancake is ready to be removed from the skillet or grill. Cook pancakes on medium heat on a preheated grill, for even cooking. Skillets or grills should be oiled or sprayed with a nonstick spray to prevent sticking. Never leave cooking pancakes unattended. Use caution when transferring pancakes from the skillet to a plate. They will be very hot. Cristel Wood is a writer specializing in food, photography, gardening and video games. She holds an Associate of Arts from South Puget Sound Community College and has worked for her local Parks & Recreation department, Mt. Baker ski area, Vista Village Retirement Community and has taught ESL in Peru.